I can’t believe we’re halfway through this pregnancy! In some ways, it’s flown by, but then other parts have dragged – I guess because I felt like I’ve just be biding my time until the next big event – appointments, ultrasounds, buying maternity clothes, telling the world…. I found myself wishing away so much time that now I find that it’s slipping away, and I need it back! 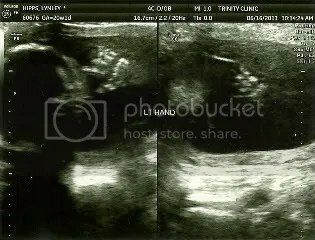 But our 20-week ultrasound went great. They did the anatomy scan – looking for all the bits and pieces to make sure she’s all there. 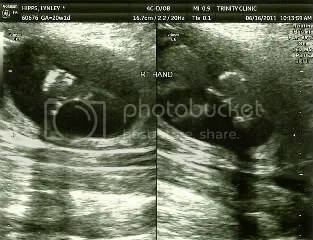 She was a little shy and wouldn’t show her face or turn over so they could get her spine, so we’ll get another look at our 24-week ultrasound (oh, darn!). But she’s definitely a little girl, and she’s definitely not a morning person, just like her mommy! 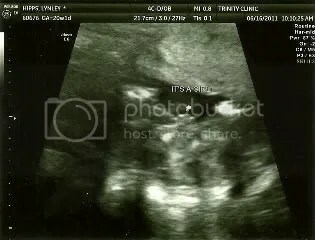 She’s been much more active in the afternoons, so hopefully we’ll get some good shots at our next ultrasound, which is at 3 pm. I started feeling her move around a couple of weeks ago – mostly weird flutters, nothing particularly distinct. 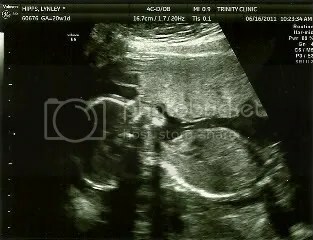 But within the last week or so, she’s definitely been kicking! It usually happens about 15-20 minutes after I eat a meal. Bennett hasn’t been able to feel her yet, but hopefully she’ll get a little stronger and start kicking Daddy, too!